While many countries already enjoy the many BlackBerry 7 smartphones out there, those devices are still making their way around the world. The country on RIM's BB7 train ride is Cambodia. Four BlackBerry 7 smartphones are available now from BlackBerry authorised retailers - BlackBerry Bold 9900, BlackBerry Bold 9790, BlackBerry Curve 9360 and BlackBerry Curve 9380. If you're looking to get your hands on one check out your local BlackBerry retailer now. Phnom Penh, Cambodia - Research In Motion (RIM) (NASDAQ: RIMM; TSX: RIM) today launched four new BlackBerry® smartphones powered by the BlackBerry® 7 Operating System (OS) for customers in Cambodia. The new BlackBerry® BoldTM 9900, BlackBerry® BoldTM 9790, BlackBerry® CurveTM 9360 and BlackBerry® CurveTM 9380 will be available beginning tomorrow from BlackBerry authorized partners. "We're pleased to bring these four new BlackBerry 7 smartphones to customers in Cambodia," said Nicholas Horton, Managing Director, Indochina at Research In Motion. "The BlackBerry solution offers an industry leading mobile communications experience that customers love and we think they will be thrilled by the faster performance, enhanced browsing, richer multimedia and localized support delivered by the powerful new BlackBerry Bold and BlackBerry Curve smartphones." BlackBerry 7 introduces an enhanced browser that provides a significantly faster, more fluid web browsing experience, and offers optimized HTML5 performance for incredible gaming and video experiences. The popular universal search capability has also been enhanced with support for voice-activated search, so users can simply speak to begin searching their device and the web for information. BlackBerry 7 includes a number of preinstalled applications and integrated functionality for increased productivity and collaboration right out of the box. The Premium version of Documents To Go is included free of charge, offering users powerful document editing features as well as a native PDF document viewer. BlackBerry® Protect is pre-loaded, offering customers the peace of mind that personal data can be backed up and secured in the cloud. BlackBerry® Balance is integrated in BlackBerry 7, allowing users to enjoy the full BlackBerry smartphone experience for both work and personal purposes without compromising the IT department's need for advanced security and IT controls. The Social Feeds (2.0) app has been extended to allow users to post updates to multiple social applications simultaneously and capture updates from news sources (RSS), social apps and instant messaging apps all in one consolidated view. The Facebook for BlackBerry smartphones (2.0) app introduces features like Facebook chat and BBMTM(BlackBerry® Messenger) integration that makes it easier for users to connect with their Facebook friends in real time. Distinguished by its beautiful design, amazingly effective keyboard and brilliant touch display, the BlackBerry Bold 9900 is crafted with premium materials including a brushed stainless steel frame that puts the finishing touch on a truly outstanding smartphone. The BlackBerry Bold 9900 is the thinnest BlackBerry smartphone yet (at only 10.5mm) and it includes built-in support for NFC (Near Field Communications), a new technology that is enabling many new and exciting capabilities, including the ability to make mobile payments, pair accessories or read SmartPoster tags with a simple tap of the smartphone. True to the BlackBerry Bold brand, the new BlackBerry Bold 9790 smartphone is powerful, full-featured and built with premium materials and finishes. It combines a high-resolution and highly responsive touch display with a highly tactile keyboard and a precise optical trackpad, but comes in a narrow design that is easy to carry and exceptionally comfortable to hold. With the BlackBerry 7 OS and powerful 1 GHz processor, the BlackBerry Bold 9790 delivers fast, smooth performance for browsing the web, running apps, working with documents, and enjoying multimedia. It features NFC support and includes 8GB of onboard memory and an expandable memory card slot that supports up to 32 GB of additional storage. 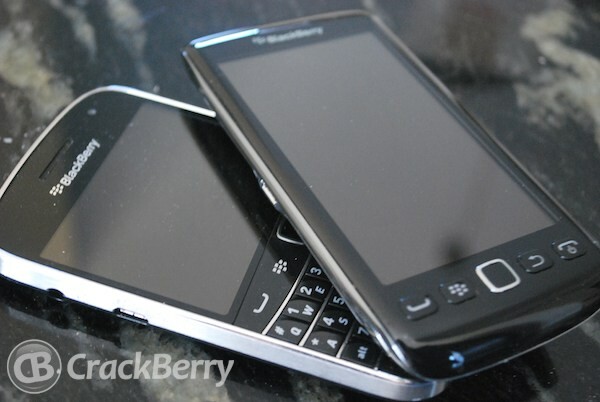 The BlackBerry Curve 9380 is the first-ever BlackBerry Curve smartphone with a touch display, and delivers the powerful social experiences, ease-of-use and compact design that distinguish the BlackBerry Curve family. It offers Curve users the choice of a large, all touch-based design with a highly responsive and brilliant 3.2" high resolution display and comes with preinstalled social networking apps, including BBM, Facebook®, TwitterTM and Social Feeds apps, that offer a fun, easy and smoothly integrated mobile experience. The BlackBerry Curve 9380 features NFC support and includes a 5MP camera with flash and video recording, allowing users to easily capture and share their favorite moments with family, friends and colleagues. The new BlackBerry Curve 9360 is ergonomically designed with a comfortable and iconic keyboard for fast, accurate typing and an optical trackpad for easy, one-handed navigation. GPS, Wi-Fi® and NFC support are also included, as well as a 5MP camera with flash and video recording so that memories can be captured and instantly shared on social networks. The microSD/SDHC slot supports up to 32 GB memory cards for additional media storage. The BlackBerry Curve 9360 delivers the world's best mobile communications and social experiences with a highly refined and integrated suite of phone, email, messaging and social apps to keep users connected and productive throughout the day.